A company has ordered a 4' x 10' solid oak conference table and wants the top to be solid 1 3/4" red oak. The table has to seat 12 people so there will be seating at the ends of the table. How far in should the legs be set so the person isn't hitting there legs on the legs. The legs are going to be solid wood with two supports 2x8 four inches off the floor on edge due to there logo to be engraved into the supports. If we make the ends 22" wide we feel the end supports will have to have a base attached to the bottom wider so the table if someone sets on the table top it won't fall over. Any suggestions or ideas for this base would be appreciated. For a 10' long table, I'd place your legs at least 18" in from the ends. The 22" width for your leg assemblies should work fine. The 1.75" thick oak top is going to be too heavy to tip over unless there were several very heavy people sitting on the edge. You could make a couple of test pedestals with some scrap to verify. 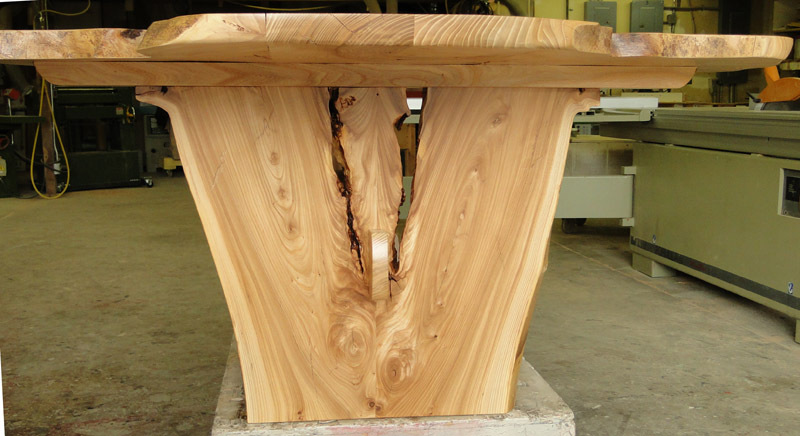 The photo is of a live edge elm dining table I made a few years ago. The top was almost 54" wide at the end shown, and the pedestal was about 20" wide on the floor. No stability issues. And the end placement is more about seating on the ends, or not interfering with seating on the side. 18" is a sort of minimum. It the design of the legs is such that the feet can go thru it, then it is less critical. I don't know what the logo talk is about. A 48 x 120 table will seat 5 per side and one at each end. This is close - family like seating, allowing less than 24" per chair. Public seating is more like 30" per or 36" as preferred. 36" will give you only 3-4 per side and one at each end. How wide are the chairs they plan to use? As far as the size of the table 48” x 120” is about the max size due to the room it fits. The chairs are going to be purchased with the 24” limit in mind while setting at the conference table. The fact that the table top is so heavy it should counter balance should a couple of heavyweights decide to use for setting on. Just wanted to check to see if you all think the 22” base at each end is sufficient. I think you are in fine shape. if the seat spacing is 24", the n you might want put the legs in to 24" from the end. This lets the end diner on the long side deal with the leg more easily than if it came into his lap and he had to straddle it. If I understand your build right, you will be able to mock it up before you lock it all down. So you can see what you are getting before you commit.